Fathers day is this Sunday. Have you thought about what you are going to do for that special father in your life? If you don’t have anything planned yet, plan to impress him with grilling dinner on the grill. Coconut Oil Marinated Chicken Kabobs is a fun, easy recipe that anyone could make on the grill. 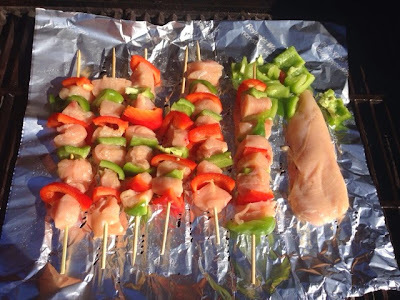 Your children can also be your little helpers in prepping the Kabobs. 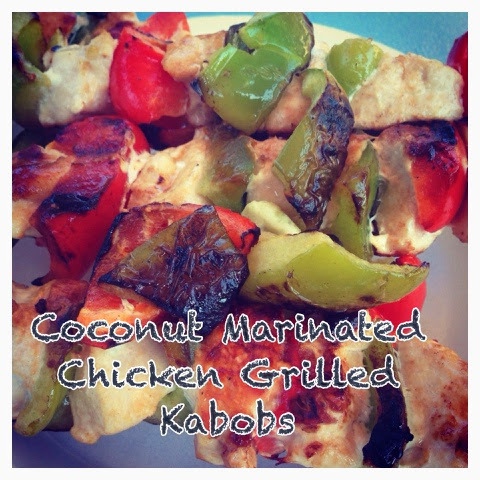 Coconut Oil Marinated Chicken Kabobs. Cut the chicken into cubes. Slice the peppers, I usually cut the peppers long ways into sections then I cut the sections in halves. Once you have all your ingredients prepped. It is time to start up the grill. While the grill is preheating you need to add the food to the kabob sticks. 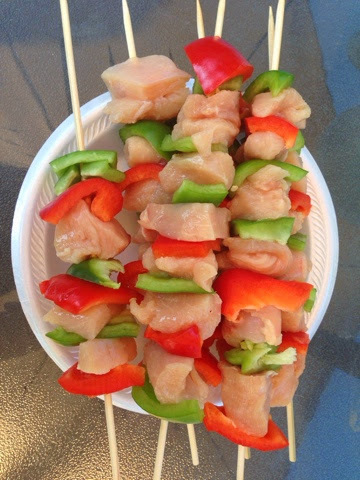 Place a pepper, then a piece of chicken, repeat that process until the kabob is full. Try to leave some room at both ends for cooking and holding. Once you get the kabobs ready it is time to brush the coconut oil on the chicken. Coconut oil becomes a liquid above 78 degrees. I just scope out a spoonful of coconut and melt it in the microwave. Once melted take a basting brush and coat the coconut oil on the chicken. Doing this will make the chicken so moist. The oil locks in the juices. When you are ready to place the food on the grill lay the kabobs on the grill. I lay down a sheet of reynolds wrap just so I don’t loose any food in my grates. If you do use reynolds wrap or a grill pan, coat it with some coconut oil. You can even coat your grill grates with it. Coconut oil can tolerate high heat and it will help your food from sticking. I have a picky eater so I made a plain chicken breast along with the rest of the meal. Cook the kabobs on, low turning them often. Your meal is ready when your chicken is done. Now you are ready to eat some of the most moist chicken that you have ever eaten. I would love to hear how your grilling is coming. Let me know your thoughts on cooking with coconut oil. I just started cooking with it and I am in love. Don't forget to check back next Thursday for more grilling ideas. If you missed last weeks post you missed a great article on how to clean your grill grates. Check it out here.